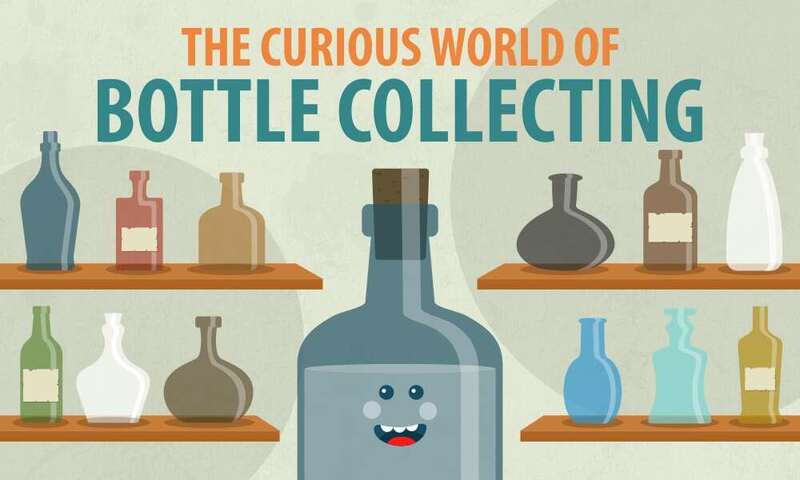 Bottle collecting has long been a hobby and even a passion for serious collectors. Many of the most desired bottles have historical significance and all tell a tale of years gone by. This history is fascinating and the bottles being collected are often unique works of art. Historically, people have held on to and passed down bottles of all types, often due to their looks or useful purposes. While they may not have been recognized as professional bottle collectors, the preservation of the bottles has allowed collectors of today to see a legitimate piece of history right in front of their eyes. Collectors also put a lot of physical effort into expanding their collection. Digging into the Earth has procured vintage bottle finds for experienced collectors. Different bottle styles will be discovered in different parts of the country based on where the bottle manufacturing took place and the types of bottles being used locally and on a regional basis throughout history. Many collectors are attracted to the world of bottles due to the clues they hold about the past. There are also avid collectors who can turn a sizeable profit on the selling or auctioning of their collection. Bottle collecting is also an important part of the equation for professionals like archeologists and educators of history. There are hundreds of thousands of innovative and uniquely-designed bottles produced in North America starting in the 1800’s and progressing through the 1950’s which are of interest to collectors. Due to the enormous amount of bottle types and designs available, it is impossible to cover every single aspect of the history of bottles. Notably, it is the most sought-after collectibles which are the focus of many collectors. There are a number of factors which makes certain bottles stand out above the others including the manufacturing date, typography used, the style of glassmaking used, glass colors, base types, and finishes. There are a number of characteristics used to date a bottle. A visual inspection of characteristics including physical aspects and manufacturing details are used to date the bottle, or at least achieve an estimated year of creation. There is no simple solution to dating a bottle outside of diligent research, which can sometimes become intense. There are bottle experts available both online and off to help amateur collectors confirm a date or design. Bottle collecting organizations like The Federation of Historical Bottle Collectors and general collecting websites like Collector’s Weekly which provide up-to-date and historically accurate information for serious and amateur bottle collectors. Notably, the most popular historical bottles for collectors come from the 19th and early 20th century. 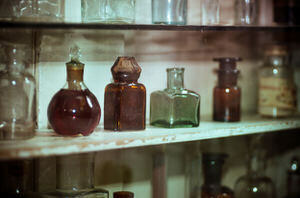 Bottles from these eras are loved for their impressive shapes, unique colors, and historical significance. Collectors seek out the most prized bottle design – the mouth-blown bottles which were created by humans and not machines. These bottles are both very much desired and also a rare find. Mouth-blown bottles originate from the 1800s. While rare marks, typography, and bottle design count towards value, it is the condition of the bottles which matters significantly. The most common bottle colors were clear and aqua. These colors were used for nearly everything except poisons. Similarly, the colors amber and black were never used for fruit jars so these types of jars are rare and collectible. Flask bottles which are cobalt blue in color are also rare collectibles. As an example of the color differences where value is concerned, a flask bottle in the common aqua color may be worth around $100. Conversely, a flask found in the dark cobalt color could fetch thousands of dollars. In addition to the rarity of the color in a glass bottle, the condition matters in the valuing of the bottle. Mint condition is the most prized condition because it means the glass is in perfect shape. 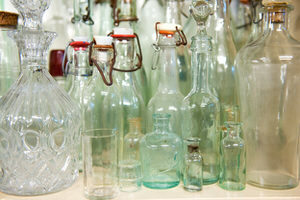 Many bottles found in attics and steam trunks are considered mint. Bottles found underground are likely never in mint condition. The condition scale ranks from “mint” to “damaged”. Damaged includes bottles with large cracks or missing pieces. Bottles with defects will also affect the value. Bottle collectors have a number of defect categories for even the smallest issues including dings, hairline cracks, and bubbles. Milk bottles – milk used to be delivered fresh from the dairy in glass bottles throughout the United States. Milk bottles are far back as those from the 1800s are still being collected today. The first known milk bottle was introduced in 1884 by a druggist from New York and patented by a different man in 1878. In the middle of the 20th century, waxed cartons replaced the classic milk bottle in many homes. Soda bottles – bottles created to hold soda water date as far back as the late 1600s. In 1832, the first carbonated water was introduced and bottles were designed to stand the pressure of the carbonated beverage. These soda bottles were typically short with long, straight bottle necks. Eventually they grew in size to accommodate pint and quart sizes. Beer bottles – until the late 1800s, beer was sold in kegs. It had to be consumed in a short period of time before the beer would go bad. When the process of pasteurization was introduced in 1876, the fermented drink was bottled and sold along the railway system. While most beer bottles were made of colored or clear glass, the first beer bottle in America was made from ceramic stoneware. Ink bottles – while ink has been used for centuries, the original ink used was in powdered or cake form. In the late 1700s, liquid ink became more common and wide-bottomed glass ink bottles were commonly used. The difference between the common ink bottle and the more unique inkwells of the time is their purpose. Ink bottles held ink for use. Inkwells were a decorative item and typically much more expensive. Perfume bottles – these bottles may be the most unique of all categories. Perfume bottles were often intricately designed by expert glassblowers throughout the 19th century. Starting in the 1800s, US glass manufacturing companies started designing the bottles in various colors and decorative shapes. The glass caps or stoppers were often the most elaborate part of the bottle. Liquor/wine/ spirits bottles – there is a significant amount of different designs and styles for antique liquor bottles throughout the years. Liquor, in fact, was one of the first reasons bottles were used for starting in the early 16th century. The most collectible liquor and spirits bottles are those made before 1919 when Prohibition started. Snuff bottles – snuff, or powdered tobacco, was first used in China in the early 1600s. Tobacco was mixed with spices and herbs. Many Chinese believed snuff had medicinal benefits including migraine relief. Snuff was inhaled through the nasal cavity which triggered a sneeze. People believed that sneeze was the body’s way of getting rid of illnesses. Snuff bottles originated when the Emperor of the Qing Dynasty ordered glass bottles to be created to protect his snuff in 1684. Apothecaries – Drugstores have been a staple of America’s small towns in the early part of the 20th century. 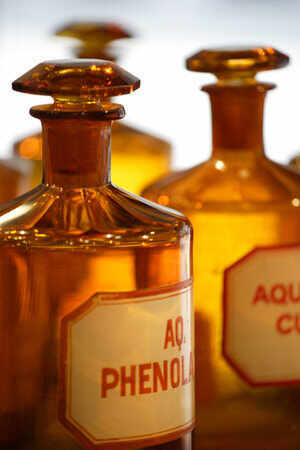 However, glass bottles used for medicinal items dates back to the medieval times. 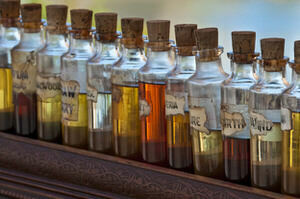 Shaman and the revered medicine man used a variety of apothecary bottles to store their herbs and remedies. eBay, online collectors – eBay and many niche bottle collecting or auction sites are a great place to start looking around for your collectibles. Both amateur and professionals use their online platforms to research, buy, and sell vintage and collectible bottles. Antique stores – Professional antique dealers will likely have a nice collection of glass bottles form all different eras. Antique dealer are also a good resource for valuing and dating bottles you already have. Yard sales, estate sales, auctions – This may be the jackpot spot for you to find valuable glass bottles. 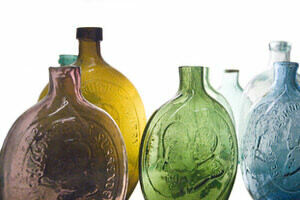 Many people have no idea or interest in glass bottle collections passed down through the years. Rather than store or display the bottles, they innocently place them up for sale, dirt cheap, just to be rid of them. If you know what you are looking for based on your interest and research, yard sales and auctions may be the ideal starting point for your collection. Your own home – You may already have a treasure trove of glass bottles of value waiting for you in your attic or basement. Read up on what to look for in a collectible bottle then sort through the old boxes sitting around your house or in storage. Looking to Sell a Vintage Glass Bottle? The most popular question about bottle collecting is “How much can I get for my bottles?”. The only way to answer that question is to do your research. Start by searching online for bottles like it already for sale on auction sites or bottle collecting sites. The values you find should not be taken as law but will give you a good starting idea of the value of your bottles. If you have an entire collection of valuable bottles, you may want to consider selling them to a professional. Appraisal services are also available to confirm the value of your bottles or collection. There are many occasions where bottle owners believe their bottle is worth more than they actually are. Before getting your hopes up too high, seek professional help to assess the true value of your bottles. On the other side of the coin, if you find bottles in your storage area check online for similar bottles before tossing them. You may end up finding a buried treasure. If you are looking to get into the business of bottle collecting, plan to spend a lot of time visiting auctions, estate sales, and online sites to learn everything you can about the particular bottle type or bottle manufacturer. The more you know, the keener your eye will become at finding value in a bottle. i am stumped…i have two amber bottles both have emblems right below the neck of a bird landing sideways. smaller bottle has the foster ff emblem on bottom. 84 18 08 on bottom. Big one has 84 18B 8 LINES IN THE MIDDLE 14 AND 3 LINES WITH TWO DOTS..
IM BAFFLED..THEY ARE NOT THE ONES WITH THE A ON THEM…YIKES..GOING CRAZY, WHAT ARE THEY? Could someone tell me please how I can get it valued. Thanks. Carole. I have a bottle but i don’t know about it. I Am Located In Vallejo California. I Have An Old Bay City Soda Water Bottle – Blue, With A Star. Is There A Location Near Me That Would Be Interested In Buying Such A Bottle? I have a large collection of old purple bottles and I’m in selling them where is the best place to see a large amount of bottles at.